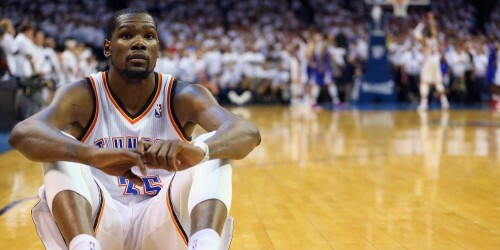 Kevin Durant is one of many superstars out with orc dealing with injury. Thanks to the #LightSkinBattle, it may have seemed for a moment that I had drifted away from the hardwood. As stated at the end of that piece, unless I hear “Drake caught the fade from Brown,” as Tyga tweeted almost two weeks ago, I will not bother entertaining that situation anymore. Back in the association, some of the superstar, top-tier players and notice that they have been sidelined due to injuries. I’m pointing the finger at Steph Curry with the pot boy (you just can’t say that enough), Kevin Durant, and “The Brow” Anthony Davis. Exactly a month ago, I wrote a piece expressing my frustration about reality — that we’ll never have an injury free season where the world’s top talent can compete against each team at their maximum potential. This piece expands upon that concept, while admitting that the injuries range both in diversity and severity. Steph is having his best season as a Golden State Warrior. If you’ve been following the baby-faced assassin’s career, you’re well aware of his ankle woes. Although this year it seems like he’s been breaking more of the opponents ankles than his own, Warrior fans constantly have Steph’s ankle paranoia in the back of their minds. Curry missed his only game against the Indiana Pacers in February due to ankle soreness, and of course, the Warriors caught a big fat L. Anytime his name is mentioned with ankle soreness, it raises a red flag. He was considered probable for the next game against the Wizards, and these seem be precautionary measures the coaching staff is taking to have their elite point guard healthy for the playoffs. After all, coach Steve Kerr comes from the Popovich school of coaching where resting your players is key. Kevin Durant has had one of his most frustrating seasons in his 8 year career. He battles foot injuries, plays for 6 games, sits for 6 games, plays, sits… extremely frustrating. With the Oklahoma City Thunder finally getting into the playoff picture by latching onto that 8th seed, KD’s talents are as valuable as they’ve ever been. But OKC shouldn’t have to worry too much. With the new acquisitions of Enes Kanter, DJ Augustin, and Kyle Singler, the Thunder has a much more formidable (and durable) roster from top to bottom that should be able to hold the fort down until KD is back at 100%. Oh, and did I mention that RUSSELL WESTBROOK IS BALLING OUT OF CONTROL!? The whole Pelican situation delivers extreme caution to NBA junkies across the nation. Not only is sharp-shooting big man Ryan Anderson out, all-star caliber point guard Jrue Holiday out, but franchise superstar Anthony Davis was out with a shoulder sprain. This couldn’t have occurred at a worse time, considering the Pel’s are right on the edge of claiming that last playoff spot currently obtained by OKC… who has now won 7 games in a row. Good luck New Orleans.